Mr. Thomas Jefferson was born on April 13th, 1743 in Shadwell, Virginia, where he lived on a slave plantation with his family. His father’s name was Peter and his mother’s name was Jane Randolph Jefferson, who was the daughter of a popular Virginia family. In the year of 1760, Jefferson went to the College of William and Mary. He studied and practiced law for many years. Jefferson was the main director in writing the Declaration of Independence. Although there were other men who helped write the draft, most historians say that Jefferson had the most input and control on the original draft. According to Charles A. Miller, Jefferson felt all humans were morally equal, but on the other hand he believed that african americans, Native Americans, and women were not culturally, physically, or intellectually equal to white males. Jefferson’s first real important political treatise, A Summary View of the Rights of British America, showed his concept of natural rights—that people have certain inalienable (not transferrable to another) rights superior to civil law. During Jefferson’s time as governor of Virginia, he wrote An Act for Establishing Religious Freedom, Passed in the Assembly of Virginia in the Beginning of the Year 1786. Essentially stating that each individual’s conscience, rather than any singular institution, should control religious matters, and the disagreement that civil liberties should stand alone from that of religious beliefs. Once Jefferson’s father died, he left Thomas around 3,000 acres of land. Jefferson was the governor of Virginia from the year 1779-1781. When he was elected, the American people were fighting the over the Revolutionary War. While governor he also produced his only full-length book, titled, Notes on the State of Virginia (1785). Jefferson’s work essentially covers the geography, flora, and fauna of Virginia, as well as descriptive components of its social, economic, and political structure. In 1782, his wife Martha died. She left three daughters, Martha, Mary and Lucy. Jefferson was overcome with sadness by the death of his wife. He became a hard working father to his daughters and never remarried. His daughter Lucy died two years after her mother. Four years later, Thomas Jefferson became the President. His opponent was John Adams. Adams leaned toward a government run by the wealthy. Jefferson wanted a government run by men only. Jefferson’s election showed that Americans wanted a leader who believed that all men were equal. Jefferson was president from 1801-1809. He also started the University of Virginia. On July 4, 1826 Jefferson died at his home. He was eighty-three years old. The day was ironically the fiftieth anniversary of the signing of the Declaration of Independence. From our Jefferson readings, do you think Jefferson is misogynistic? Would Jefferson’s methods be acceptable today? Can you see evidence of Jefferson’s tone and style in the Declaration of Independence? 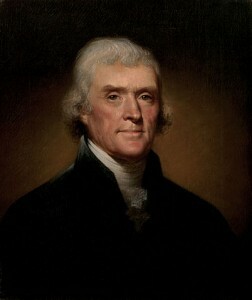 “Thomas Jefferson Essay – Critical Essays – ENotes.com.” Enotes.com. Enotes.com, 2015. Web. 22 Oct. 2015. Thomas Jefferson Foundation. “Thomas Jefferson’s Monticello.” Thomas Jefferson, A Brief Biography. N.p., 2007. Web. 22 Oct. 2015. The Open Anthology of Earlier American Literature: A PSU-Based Project by Samuel Metivier is licensed under a Creative Commons Attribution 4.0 International License, except where otherwise noted.